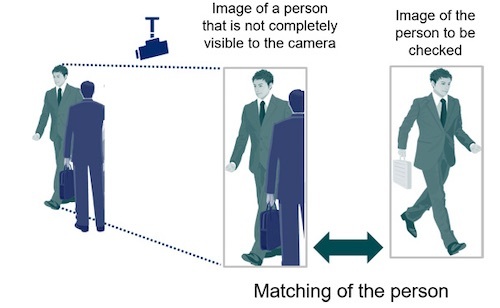 TOKYO, Feb, 08 2019 - (JCN Newswire) - NEC Corporation (TSE: 6701) today announced the development of a "Person Re-identification Technology" that is capable of matching images of people whose figures are partially hidden from cameras, even if the image is taken from behind or from the side. This technology analyzes the entire appearance of a person's photo image, such as their clothes and body shape, to determine whether they match with other images of people. Using the image analysis and deep learning technologies that NEC has cultivated through Facial Recognition Technology and other technologies, NEC was able to establish this high-precision technology that does not rely solely on facial images. This technology enables a wide range of people to be recognized, even in places where there are many people or visual obstructions that prevent a person's face or body from being fully seen. "NEC has a large portfolio of world-class biometrics certification technologies that include facial and fingerprint recognition(1)," said Masayuki Mizuno, general manager, Biometrics Research Laboratories, NEC Corporation. "We are now expanding this portfolio within our NEC Safer Cities(2) solutions, our NeoFace facial recognition AI-engine that boasts the world's No.1(3) accuracy, and NEC's advanced video analyzer." NEC's unique ingenuity in deep learning technology is used to match a person's image by automatically selecting other parts of thier image when there is overlap between multiple people, such as in crowded or shaded environments where a person's full image cannot be viewed. The matching rate for a person is as high as 90%(4).